Returning to 'Alpaca - The Mini Series', we last saw this fiber after it had emerged from a lovely dip in a dye bath of madder. It's now time to card, spin and knit! 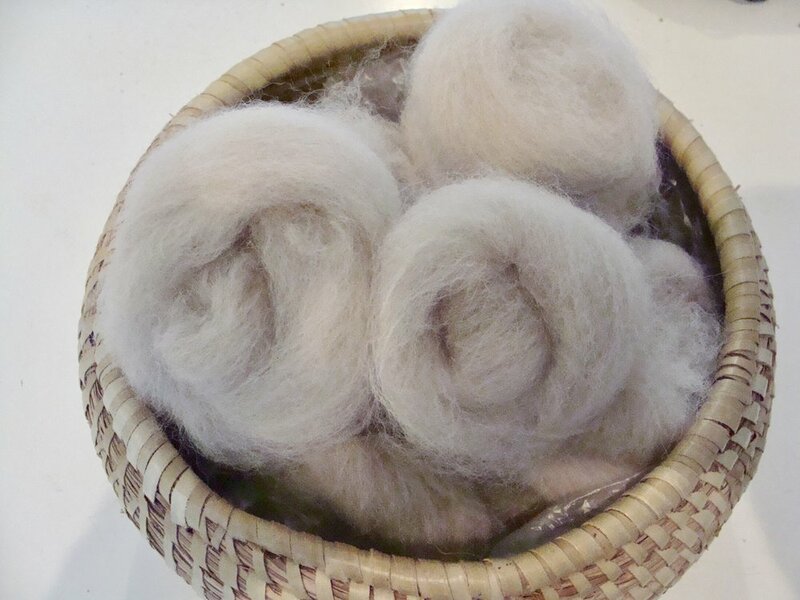 Previously, I wrote about prepping alpaca fiber for spinning using hand combs. Today's post is about a different technique, a carded preparation using a drum carder. FYI - Here is a recently published little article from Interweave about hand cards. You've met my Strauch Drum Carder in several previous posts including this one on blending color and fiber. For a more detailed article on carding fiber with a drum carder, please see this post which has a lot more pictures and explanation of the process. I made three passes through the drum carder. Above you can see the difference between the first pass (on left) and second pass (on right). With each pass, the fibers become more aligned and homogenous; although carded fibers will not be as aligned as fibers prepped by combing. Little nests of fiber waiting in the basket for their time on the spinning wheel. But . . . . .
. . . . Oh no! The yarn I spun was definitely over twisted!! And this photo is after soaking and allowing it to dry. It felt harsh and lacked luster, not at all what I wanted. So . . . . what's a girl to do? I ran it back through my wheel in the opposite direction. Technical Alert: I originally plied with 4 treadles on 10.5:1 ratio (S) then when I returned it to the wheel I treadled 2 times on 7.5:1 ratio (Z). That worked! Much better!! I like!!! The other two colors were undyed, a light taupe (which was also used as the base for the madder dyed) and a natural black. As with the madder dyed yarn, these both were drum carded and spun worsted. However, this time, when plying, I went with a larger ratio whorl and slower treadling to spin a lighter and lower twist yarn than my original over-twisted madder dyed yarn. * I talked a little about second cuts in the post on Alpaca Shearing. Picture Two shows a nep - a small knot of tangled fibers Just like second cuts and guard hairs, ideally these should be removed. Picture Three - this one I don't know how to explain. When I spin black fleeces, my spinning fingers always are black. I guess it could be just dirt, but the fleeces are always washed and prepped the same way and I don't get black fingers with other undyed alpaca colors???? The project I chose for this handspun yarn is the Button-Up Neck Warmer by Mavis Adam, specifically the variation adapted by Unni Heineking for handspun alpaca yarn. This was originally published in the Spring 2009 issue of Spin-Off magazine. The project notes called for 6 ounces of alpaca yarn, 2 ounces of each color. I ended up pretty close to that target and still had remaining yarn to spare. Madder, 2.15 ounces/93.3 yards [actually used 48 yards]. Black, 2.65 ounces/115 yards [actually used 85 yards]. Taupe, 1.95 ounces/103 yards [actually used 40 yards]. Each of the finished 2-ply yarns averaged 17 wraps/inch. Using a US size 4 needle, the knitted neck warmer produced a dense fabric and displays a slip-stitch harlequin pattern. A single crochet row finishes the edges. The buttons are crocheted and stuffed with additional yarn. The finished neck warmer is 5 1/2 inches by 24 inches and will be perfectly cozy when the weather turns cool. As you have probably noticed, I have not posted much weaving lately. But that does not mean my looms are sitting vacant and lonely in the corner. 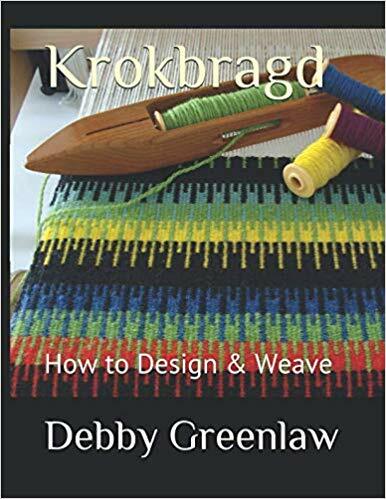 They are busy producing sample projects for my book 'Krokbragd-How to Design & Weave'. Here's a sneak peek at one of the projects in progress!